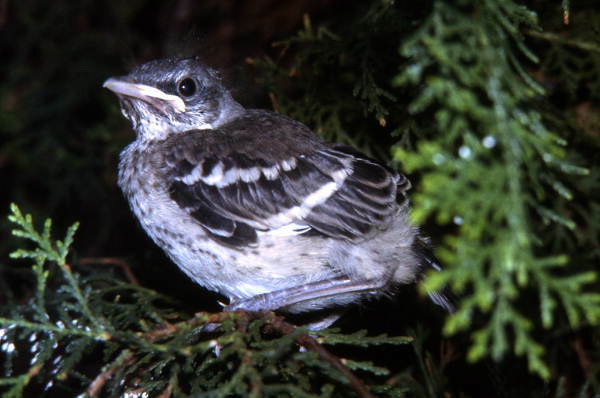 On October 13, 1977, House Bill 58, titled “An act relating to anthropoid or humanoid animals, prohibiting the taking, possessing, harming, or molesting thereof…,” passed through the House Criminal Justice Committee. 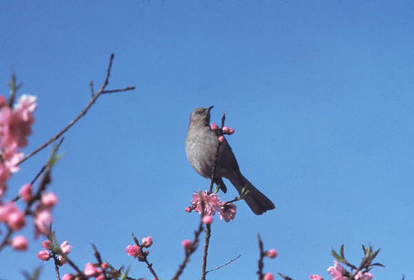 Sightings of apelike creatures were booming in the 1970s, particularly in South Florida. In response, Representative Hugh Paul Nuckolls of Fort Myers sponsored a bill to protect the Florida version of these mysterious creatures, the Skunk Ape. Nuckolls introduced the measure after a similar bill (HB 1664) failed to pass during the previous legislative session. Unfortunately, House Bill 58, also known as the Hugh Paul Nuckolls Skunk Ape Act, died without passing and Skunk Apes remain without legislative protection in Florida. The Skunk Ape Act stimulated interesting conversation among the legislators who considered legal measures to protect Skunk Apes in Florida. Click on the thumbnails below to read a partial transcription of deliberations concerning House Bill 58. On April 20, 1967, the Florida Legislature designated orange juice as the official beverage of the Sunshine State. 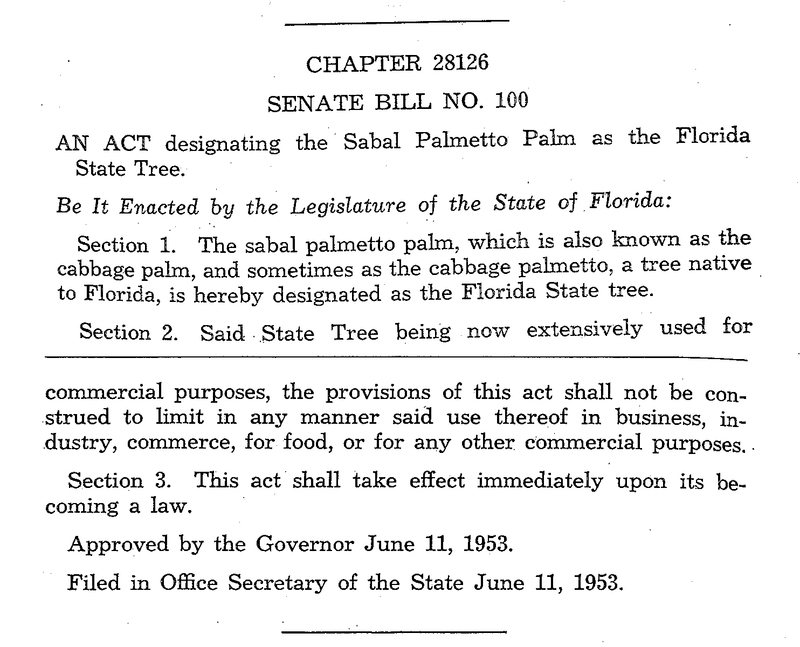 On June 11, 1953, the Florida legislature designated the Sabal Palm (Sabal palmetto) as the state tree of Florida. The Sabal Palm—also known as cabbage palm, cabbage palmetto, palmetto, and countless vernacular terms throughout the southern United States and the Caribbean—has provided food, shelter and inspiration to Floridians for thousands of years. 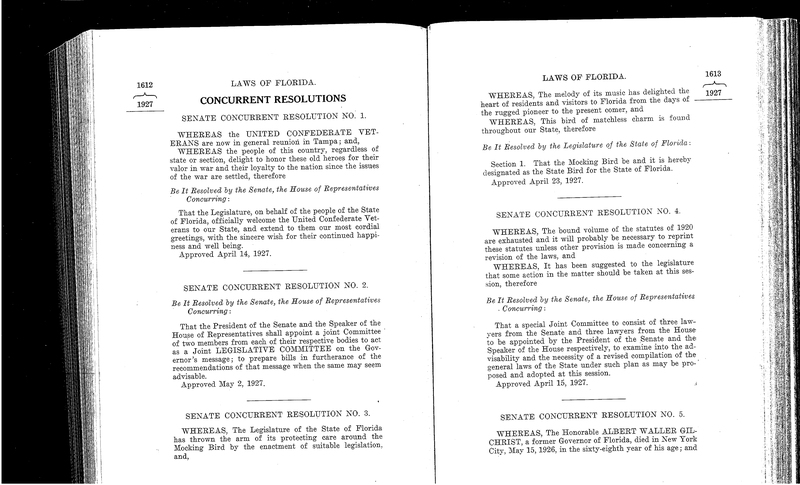 From: General Acts and Resolutions Adopted by the Legislature of Florida… (1953), 405-406. Florida Seminoles and Miccosukees, like indigenous Floridians before them, construct traditional housing using leaves and trunks from the Sabal Palm. These structures, known as “chickees” in the Mikasuki language, are an important symbol of modern Florida Indian culture. Swamp cabbage is a popular Florida dish made from the hearts of Sabal Palms. Swamp cabbage can be prepared and served in many ways, but it is usually fried, stewed or boiled for canning. Landscape artists, from the Hudson River School’s Martin Johnson Heade to Albert Ernest “Bean” Backus and the Florida Highwaymen, have found inspiration in Florida’s state tree. Thank you, Sabal Palm, for your service to the state of Florida! Found a great Sabal Palm photo that we missed? Share it with us in the comments. On June 7, 1949, the Governor of Florida, Fuller Warren, approved Senate Bill No. 34, which required owners of livestock to prevent their animals from “running at large or straying upon public roads.” Under its provisions, ranchers could be held liable for damage done to property or persons by free roaming livestock. From: General Acts and Resolutions Adopted by the Legislature of Florida... (1949), 545. The act empowered law enforcement officers to “impound livestock running at large,” and to fine delinquent owners the cost of caring for detained animals. If livestock were not claimed within three days of apprehension, the animals would be sold to the highest bidder. If no buyers came forward, the animals could be slaughtered and disposed of at the discretion of local authorities. When Senate Bill No. 34 became law, many in the Florida cattle industry already supported fence laws. From the 1920s to the early 1940s, ranchers were required to treat cattle for ticks. Outbreaks of tick fever could be devastating, and fences made the required roundups easier and less costly. Although Florida was declared tick free in September 1944, outbreaks occurred again in the late 1940s, 1957 and 1960. In the second half of the 20th century, the expansion of citrus cultivation, increased development, and tick scares combined to end the reign of Florida’s cow hunters. Senate Bill No. 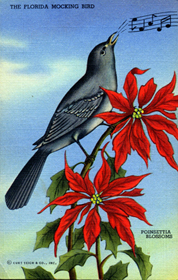 34 symbolized the close of the Florida frontier. On February 8, 1832, Florida’s Territorial Legislature repealed an anti-dueling law. This measure effectively legalized dueling in the Florida territory. The prevalence of dueling attests to the nature of violence and elite masculinity in the antebellum south. In the above placard, William Tradewell challenged rival politician Leigh Read to a duel. Read had previously made a series of inflammatory remarks about his opponent, causing Tradewell to demand an apology. Though the two never squared-off, both men became known for repeatedly resorting to violence as a means of solving disputes.